This map shows all currently running regions under weather@home. At the start of the project in 2010 initially, three target regions where chosen and described here in more detail: the Western US, Southern Africa and Europe. These were chosen because the majority of climateprediction.net participants (to date) live in Europe and the US, and because Southern Africa is a region thought to be particularly vulnerable to climate change. All regional experiments will ultimately be managed from our partners within the region, but the development of the models (to date) takes place in Oxford. The ultimate aim is to have model simulations for all CORDEX regions in the world, the Coordinated Regional Climate Downscaling Experiment, is a World Climate Research Programme (WCRP) framework to evaluate regional climate model performance through a set of experiments aiming at producing regional climate projections. 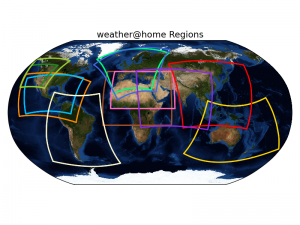 Our regional models for weather@home were initially deployed as separate applications e.g: hadam3p_eu, hadam3p_anz, hadam3p_afr, hadam3p_pnw. More recently we have developed a single application (weather@home2/ wah2) that can run different regions on demand. The region is specified in the workunit and will appear as part of the workunit name e.g. wah2_eu25, wah2_sas50. Results from our regional modelling experiments are freely available to anyone investigating the impacts of weather and climate changes across the available regions. Scientists interested in using this data should contact the weather@home scientific coordinator, Friederike Otto. The weather@home application hadam3p_eu is a 50km region matching the EURO-CORDEX domain. This is our own home region and thus also our experimental region with currently the largest data sets available. The wah2 EU25 region was developed for the MARIUS project and differs slightly from the EURO-CORDEX domain. The wah2 EU50 region differs slightly again and is rotated slightly to avoid including Greenland at the edge of the domain. The first is labelled PNW for Pacific North West, is an unusual region as it is smaller than our other regions and has a resolution of 25 km. The model region encompasses the Eastern Pacific Ocean and the Western US, extending inland as far as the Rocky Mountains. North to south it stretches from Canada down to the Gulf of California, and includes the Coast Range of mountains. The second is labeled WUS and is a slightly larger region than PNW, stretching slightly further north and east. The Western US regions are coordinated from our Partner Phil Mote at Oregon State University. We have two central America regions, a 50km region and a slightly smaller and rotated 25km region. This Central America experiments are conducted in collaboration with our partner Ruth Cerezo-Mota at Universidad Nacional Autónoma de México. It will be used for TITAN and other future projects. We have a 50km South America region which covers the CORDEX South America domain. This South America will be used for future projects. This region includes the whole of Australia and New Zealand at 50 km resolution. Results of this experiment will go to our partner David Karoly at the University of Melbourne and analysis will also be undertaken by Sue Rosier at NIWA (The National Institute of Water and Atmospheric Research), Wellington, New Zealand. This is the CORDEX region South Asia which stretches from the Horn of Africa and the Arabian Peninsula in the West to Vietnam and Cambodia in the East. In North-South direction it includes the Himalayas as well as Lake Victoria, India and the surrounding Ocean is in the centre of the region. We have developed an East Asia region to be used for future projects. This differs from the CORDEX East Asia region as it goes further south and includes all of Indonesia and Papua New Guinea. The hadam3p_afr region is a 50km region over most of Africa apart from Southern Africa (excluding countries from Namibia, Botswana and Zimbabwe southward). This region was developed for the ACE-Africa project. We additionally have a smaller 25km region over North Africa and West Asia for use in future projects. This globe shows all currently running regions under weather@home.